Before the 1870s, the bone supply for domestic toothbrush manufacturers came largely from urban centers in the United States. Bone pickers, mostly immigrants of German descent lived in tenement buildings or communal apartments in cities like New York, Philadelphia, and Newark. Typically, bone pickers–including wives and children–left home before dawn to pick through the urban trash of the previous day. Items of value, like rags for paper making, or bones, were taken back to the home to be washed and stored until they were sold. An 1879 print shows a rag pickers’ tenement in New York: rags can be seen hanging from strung lines and a pile of bones is seen in the right foreground. As benevolent societies rose in the United States, bone picker tenements were viewed as centers of filth–both physically and morally–and were slated for cleanup by city officials. In Newark, New Jersey, bone pickers organized an exchange to regulate the gathering, cleaning, and sale of bones in order to protect the interests of pickers. After gathering bones and rags, pickers met to discuss the day’s products, and set prices. The exchange was well regarded by both buyers and sellers, as well as city sanitation officials, who left waste on the streets until pickers made their rounds. 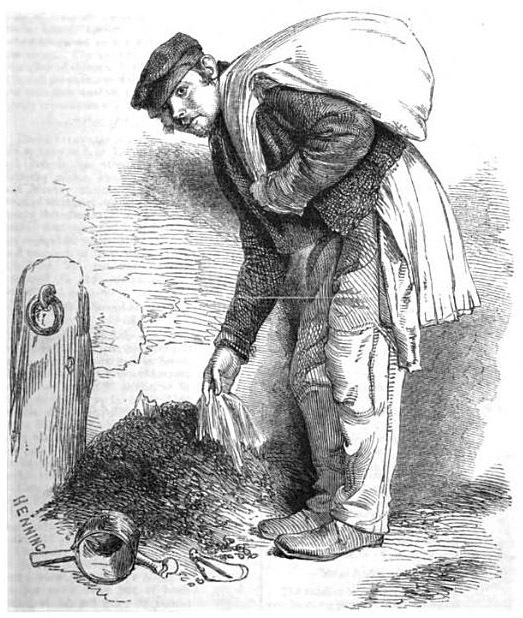 Though picking was considered a filthy living, writers thought pickers better than beggars within the social hierarchy. Some immigrants were able to use bone picking as a way to save enough to travel west and settle farms, forever leaving urban tenement life behind.